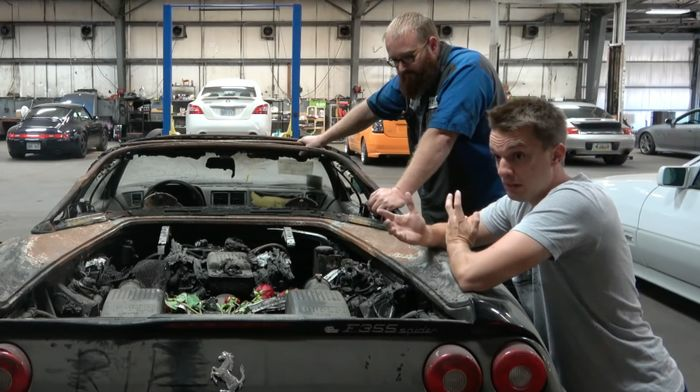 Tyler Hoover’s poor F355 made headlines for all the wrong reasons a few weeks ago, when it went up in flames with fellow YouTuber Parker Nirenstein - aka Vehicle Virgins - behind the wheel. Thankfully, both Parker and his passenger emerged without serious injury (although the latter did, unfortunately, receive burns to his leg). Hoover has since brought the car to the workshop of his trusted mechanic The Wizard for further examination and a little ‘CSI’ work. It looks as though the cause of the fire was a fuel line leak, and not the fault of the power steering cap, as was initially thought. Ferrari had recalled the F355 for this problem - caused by rubbing lines - but this particular car was never sent in for the work. Hoover - who has since bought the USA’s cheapest Testarossa as a replacement - purchased the car from the Insurance company, and sold it on to Freddy ‘Tavarish’ Hernandez. He has a similar penchant for cars that threaten financial ruin, but even for him, putting the crusty F355 back on the road is going to be one hell of a job. As we can see from the video at the top of the page, the car really is in a bad way. 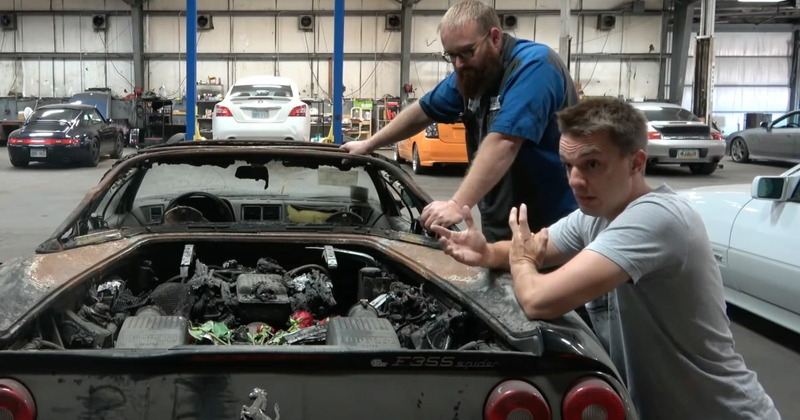 There doesn’t look to be a whole lot in the engine bay that can be salvaged, the top part of the bodywork is badly burned, and the interior is ruined. The front end of the car would have emerged unscathed, were it not for the fact firefighters took an axe to it. Whatever happens to it next, though, is going to be worth a watch.